“Okay, I admit it. I love soup. And no doubt you’ve noticed. It’s not like the past several posts have been all about soup or anything. When browsing through Deborah Madison’s “Vegetable Soups” cookbook I could so relate to her opening words, “When I said I was working on a soup book, the response was often, “Oh, I love soup!” People enthuse about soup in a way that is so heartwarming it makes me feel I am in the right camp . . . ” Yes, Deborah, add me to that list of folks in your tent. It’s no secret, I am in a full fledge love affair with soup. If you are a vegetarian than Deborah Madison is likely a familiar name to you. I love her simple, straightforward style and I haven’t made a recipe out of one of her books that I haven’t liked yet. As I flipped through her book today, I wanted an easy pantry recipe that would accommodate chard–the only green thing I had in my refrigerator. Her recipe also called for cilantro and parsley and I think the cilantro would be divine in this soup. But as mentioned, cilantro is green and that wasn’t something in the mostly empty refrigerator. I did add celery to give it some texture and I added a whole lotta garlic. But other than that the recipe is pretty true to hers. This comes together with very little prep. Just throw it all in a soup pot, read a book, then come back and enjoy! In a large dutch oven put 8 cups water, lentils, red onion, garlic, salt and pepper (I started with 1 tsp salt and 1/2 tsp pepper), cumin, chile flakes (a pinch or to your taste), and bay leaves. Bring to a boil and then reduce heat to low and let simmer for 25-40 minutes or until lentils are tender. Add in finely chopped celery and chard and simmer 10-15 minutes more or until celery is tender. Remove bay leaves and add more salt and pepper to taste if needed. Add a squeeze of lemon juice to brighten the flavors if desired. Footnotes: Uh, did you notice? There were no extra steps to cooking the onions first. That also means you get to skip the added oil. This soup works great to just throw everything in the pot and simmer away. That makes this an ultra-easy weeknight meal. Or in my case a “I’m-too-lazy-to-cook” meal”. Make a extra big pot and take for lunch the next day. Serve with some crusty bread for full fledged satisfaction. Thank you Isabella! 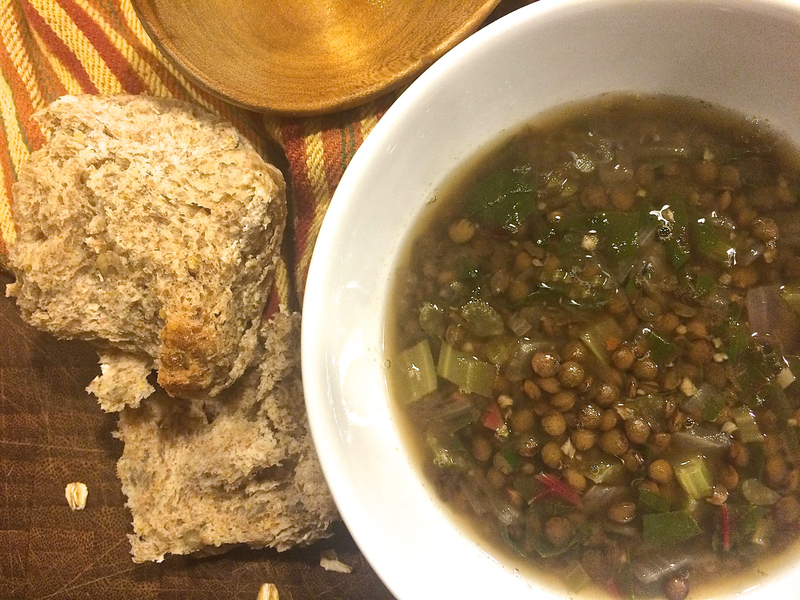 I love lentils too and this is a great way to start the new year. It’s delicious but light. Thanks for the comment. Have a great 2015! This looks really good. Perfect for my SloCooker this winter. Well Hello Toni! I didn’t even think about the slow cooker. It would be perfect for that!